The latest British TV invasion is Grantchester, very British indeed. Here’s what’s up in the world of TV for Sunday, January 18th. All times are Eastern. Grantchester (PBS, 10 p.m.): The latest import to grace our shores several months after it premiered in England premieres on PBS tonight! 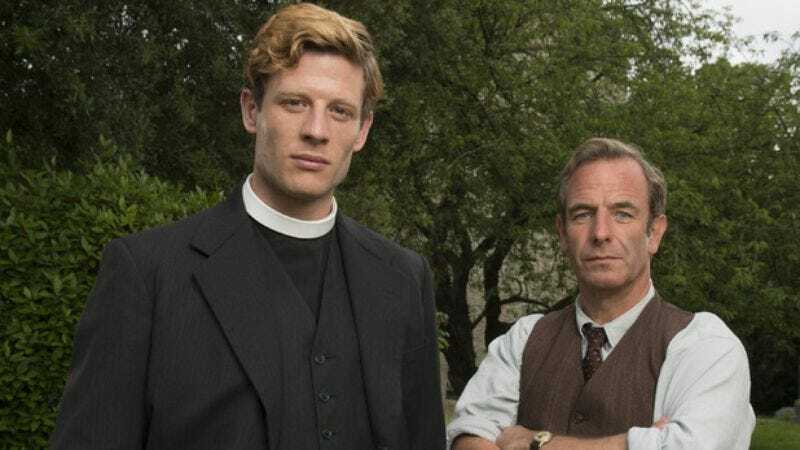 Grantchester is a 1950’s era drama about a handsome former World War Two soldier named Chambers who becomes a small-town vicar slash part-time detective. Grantchester is, by far, the most British option on television this night or maybe any night, ever. Downton Abbey (PBS, 9 p.m.): Yes, Downton Abbey is on tonight, and yes, Grantchester is still the most British show on tonight. But Emily Stephens is still hopeful for some fisticuffs! The Librarians (TNT, 9 p.m.): The first season comes to a close with someone changing the course of fate and exposing alternate timelines and possibly doom. (Something something “Remedial Chaos Theory” something.) Never has a show’s title and its summary been so beautifully disparate. Austin and Ally / KC Undercover (Disney, 8 p.m./8:30 p.m.): We haven’t been paying attention to the Disney Channel recently, but we can respect a season premiere named “Buzzcuts And Beginnings” (Austin and Ally) and a new series about teen spies (KC Undercover, starring something called a “Zendaya,” period end of name). Nicki Minaj: My Time AGAIN (MTV, 10 p.m.): The only thing wrong with this is that it’s not called Nicki Minaj: My Time ALWAYS. NFL Special: NFC Championship Game (FOX, 3:05 p.m.): The Seattle Seahawks take on the Green Bay Packers, and for comment on this football situation, we turn to What’s On Tonight’s roommate. What’s On Tonight’s roommate? “It’ll probably be the Packers…though the Seahawks have been doing well, despite reports of infighting.” Thanks, What’s On Tonight’s roommate! NFL Special: AFC Championship Game (FOX, 6:40 p.m.): The Indianapolis Colts tackle the New England Patriots. What’s On Tonight’s roommate? “Ugh. Probably the Patriots.” Thanks, What’s On Tonight’s roommate! Hot Fuzz (BBC, 5 p.m.): Meanwhile, the BBC isn’t scared of football—sorry, American football—and so it’s airing Edgar Wright and Simon Pegg’s ode to detective work in a small town that’s not all it seems. The moral of this What’s On Tonight? Never move to a small British town. 12 Monkeys: Syfy’s latest is a time travel drama based on Terry Gilliam’s film 12 Monkeys, but Emily Stephens found it “sterile.” Please direct your attention and opinions thataway.